Blizzard assures its Mei fans that Mei will be getting another legendary skin "early next year". Overwatch got itself a winter event earlier in the week, showering players with plenty of seasonal goodies for their favorite characters. Except Mei, apparently. 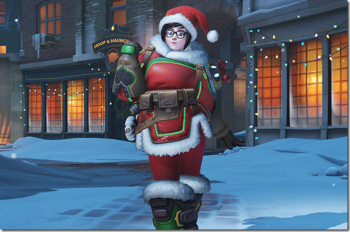 Fans were disappointed that the character's first new Legendary skin to be added since the game launched, wasn't particularly legendary, and appears to be a mere re-color of her standard parka with the addition of a Santa hat. Blizzard has noted this, and apologized, saying it was "off" on the coolness factor this time, but not to fret, as they have something special in store for Mei early next year. Apologies that our "cool meter" was off from yours on this one. We'll try to align better on future content." Like Kalpan said, the snowman Cryo-Freeze is certainly a cool addition, but doesn't really justify the rest of the skin being so plain.